Whitney Biennial, take note. Contemporary art is taking over the city of New Orleans for "Prospect 3," a city-wide festival comprised of 58 artists and 18 locations. And, as reported by Julia Halperin for The Art Newspaper, it's "the most racially diverse US biennial in recent history." Of the exhibited artists, 22 are African-American and 44 are artists of color. While Whitney Chief Curator Donna De Salvo dubbed 2013's biennial "one of the broadest and most diverse takes on art in the United States that the Whitney has offered in many years," it featured only eight (non-fictional) black artists out of 103 total. There were 23 represented artists of color. "We didn’t talk about it," Brooke Anderson, Prospect’s executive director, told The Art Newspaper of their show's historic statistics. Numbers aside, the biennial is just as daring and diverse in its content as it is on paper. Participating artists range from the classic big names (Jean-Michel Basquiat, Paul Gauguin) to the under-acknowledged legends (Joan Mitchell and Alma Thomas). There are contemporary giants (Carrie Mae Weems) and buzzy up-and-comers (Ebony Patterson) -- all working in a diverse array of media ranging from Abstract Expressionist paint to bedazzled collages. And then there's the subject matter. This year's artistic crop tackles themes including The New Orleans Experience, Seeing Oneself in the Other, The South, Crime and Punishment, The Carnivalesque, as well as issues of the prison-industrial complex and gentrification. "'The peculiar institution' of slavery and immigration during the 18th century created a city that, even in 1961, was a complex social arrangement, one that remains palpable today," Artistic Director Franklin Sirmans expressed in a statement about New Orleans. "The third Prospect biennial (P.3) is invested in and will explore ‘the search’ to find the self and the necessity of the other as part of that quest." 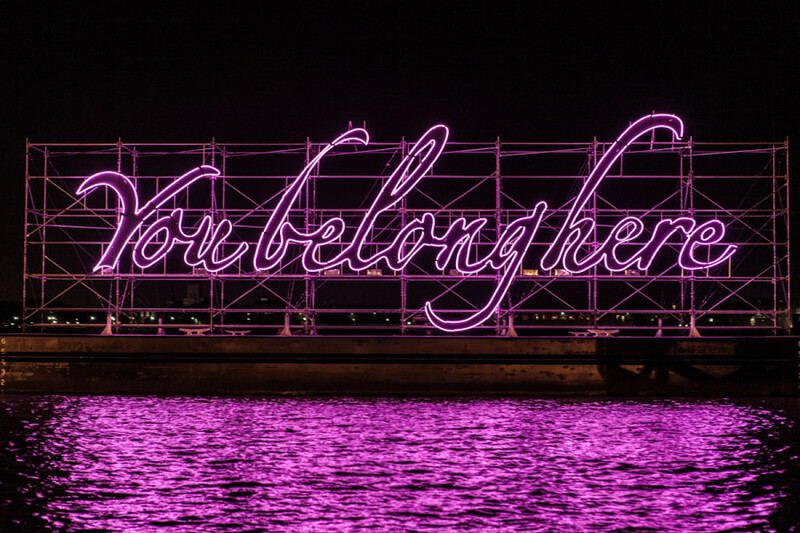 Tavares Strachan's "You Belong Here"
One piece garnering attention this year is Tavares Strachan's "You belong here," an 100-foot neon pink sign that floats up and down the Mississippi River. The somewhat ironic work addresses the city as a whole, raising questions such as "Who gets to determine if we belong?" and "And if so, then where?" The dazzling signage encourages viewers to download an app to enhance the experience, providing audio commentary and additional tours of New Orleans sites rife with history. Money raised from the app's sale will benefit New Orleans based nonprofit programs encouraging culture and education. Los Angeles artist Glenn Kaino is bringing an installation titled "Tank" to this year's biennial, comprised of aquariums filled with coral and resin casts of an armored tank. The US military drops such tanks into the ocean after they've been decommissioned, and for the past five years Kaino has been studying how said tanks become unlikely habitats for coral. Kaino compares the coral's struggle for space to New Orleans' gentrification. 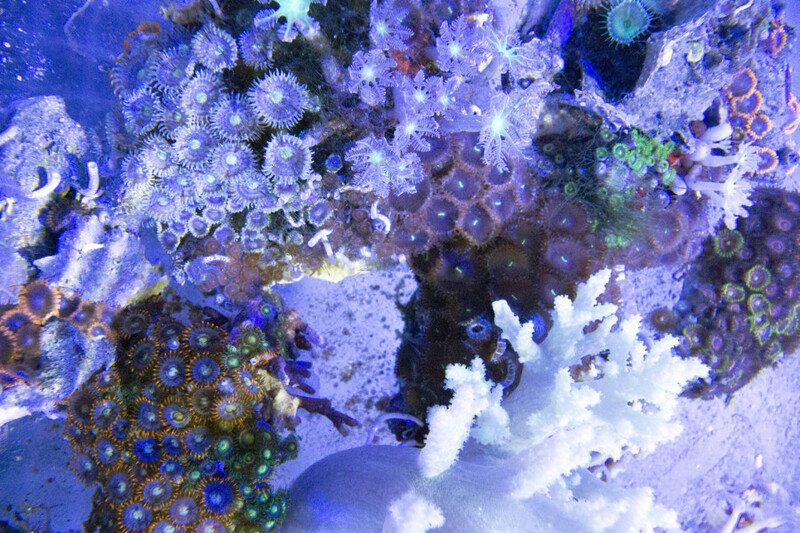 Glenn Kaino, Studies for Tank, 2013-14, Live Corals (green star polyps, pulsing xenia, yellow polyps, acroporas, mushrooms and sinularia), Clear Casts, Rocks, Water Tanks, Water Aquarium System Management, Lights. The biennial also includes a Satellite Program, encouraging local artists to participate in the event. One such artist is Kirsha Kaechele, who has organized a gun buyback at a local carwash as a work of performance art. The piece, titled "The Embassy," engages local rappers and artists in putting an end to the gun violence that's affected the lives of so many New Orleans natives. "My hope is that the young men in the 8th Ward and the surrounding neighborhoods are inspired to trade killing for creativity," Kaechele told The Huffington Post. "Healing in the neighborhood, by the neighborhood." Prospect 3 runs from October 25, 2014 until January 25, 2015 at various locations around New Orleans. Visit the website to learn more and plan your visit. It's not to be missed.